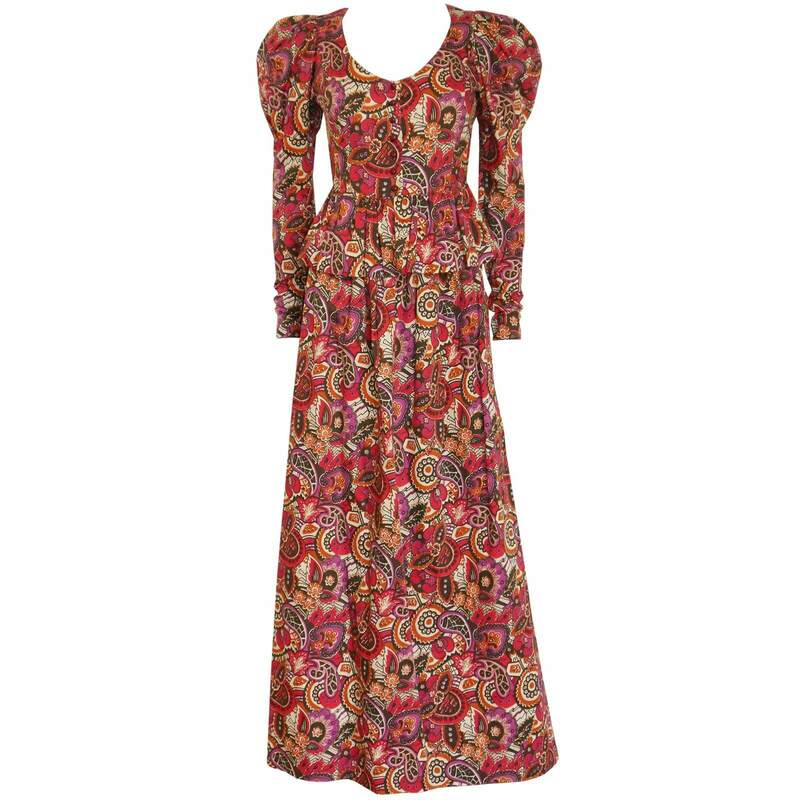 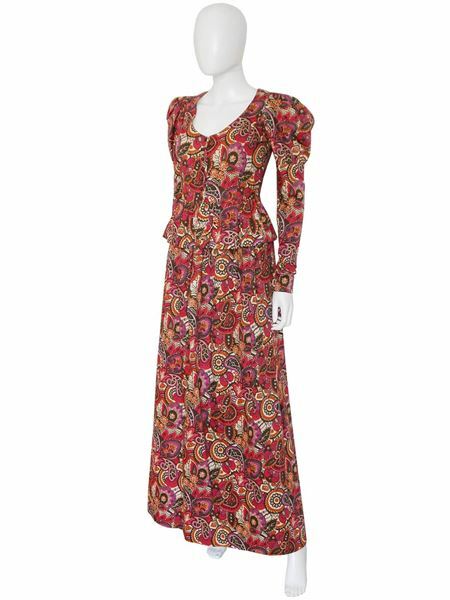 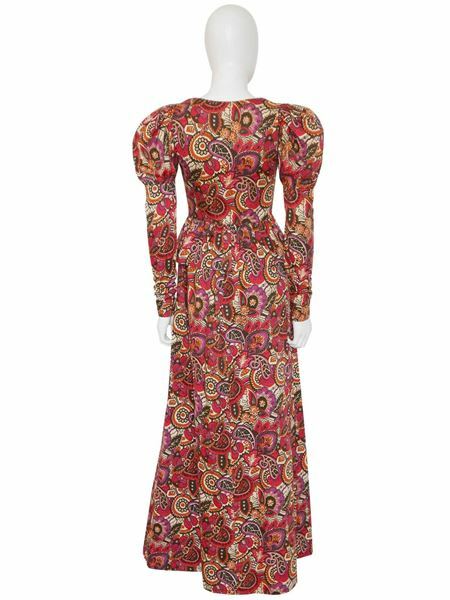 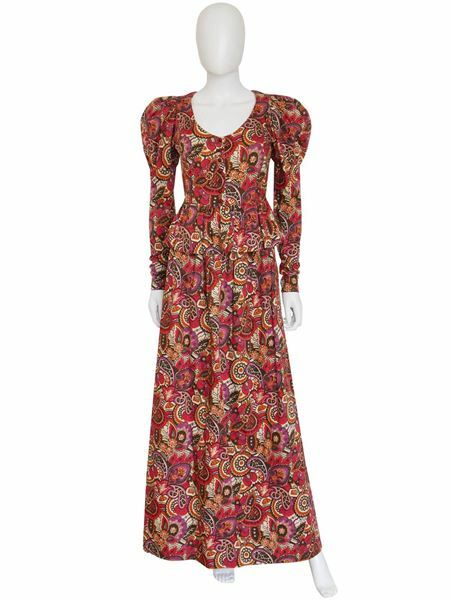 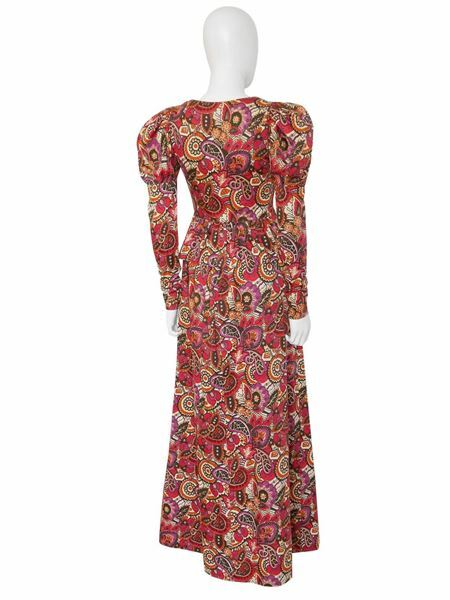 An Yves Saint Laurent ensemble from c. 1970 comprising a jacket and a maxi skirt. 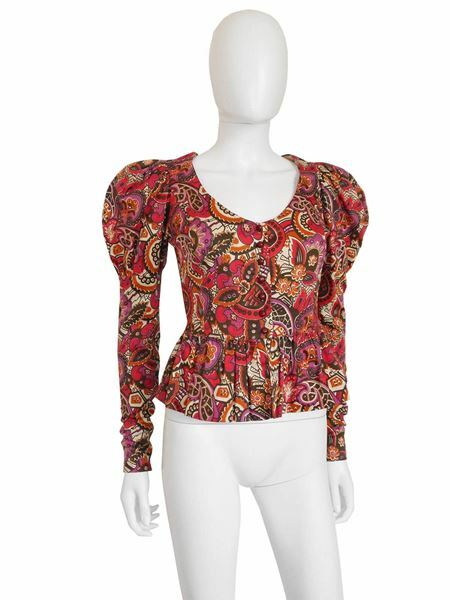 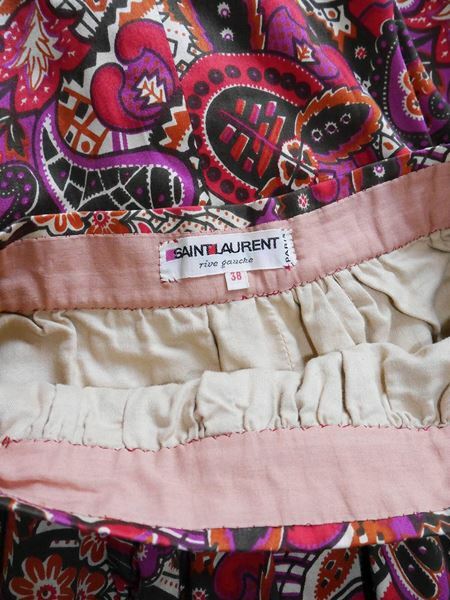 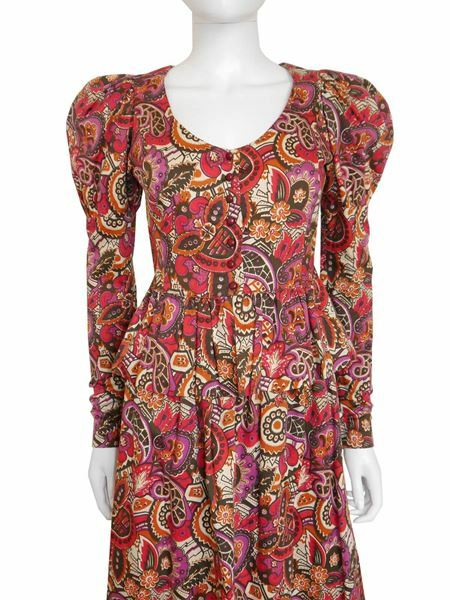 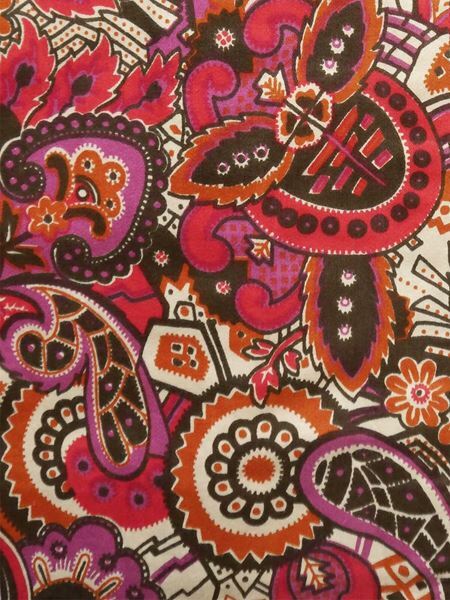 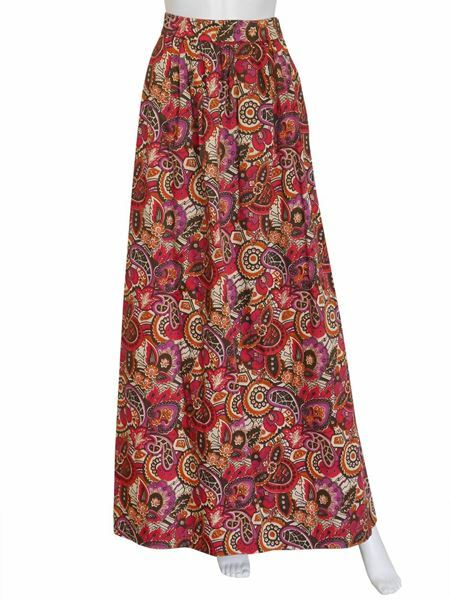 Both pieces are made of cotton with an elaborate print in beige, burnt orange, fuchsia, red and dark brown. 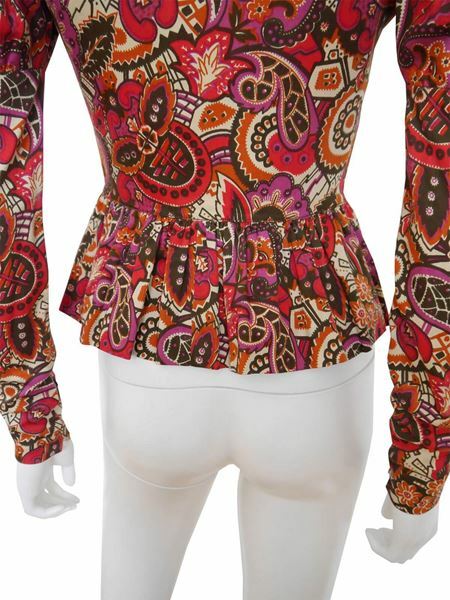 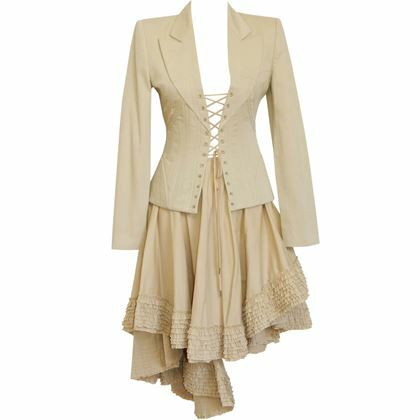 The fitted jacket features a scooped neckline, leg o'mutton sleeves with zippered cuffs and a peplum waist and closes with its original purple buttons. 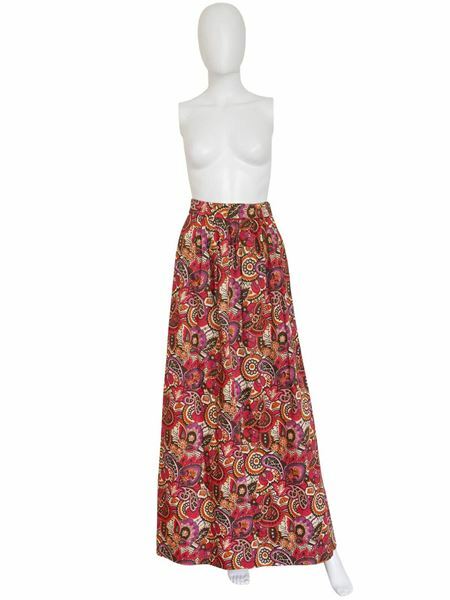 The full-length skirt is slightly flared and closes with the original metal zipper and metal hooks and eyes. 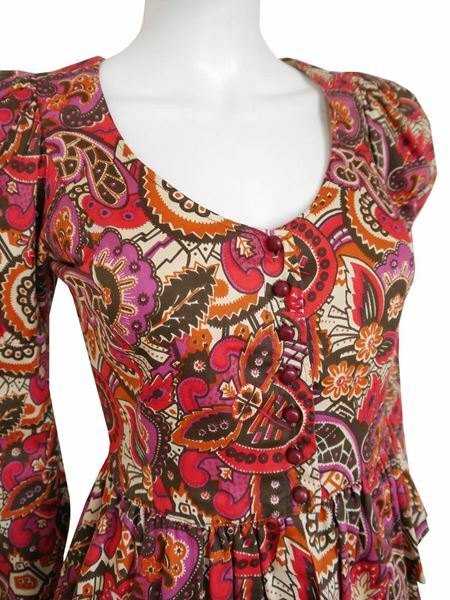 Both pieces are lined in cotton and feature many hand sewn details. 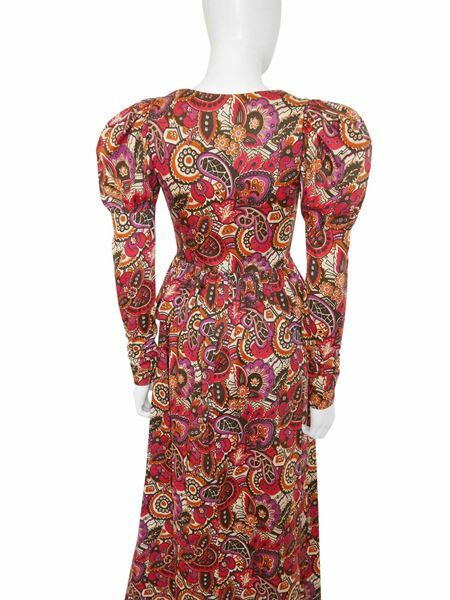 The reference pic shows Yves Saint Laurent with Raquel Welch, shot by Terry O'Neill. 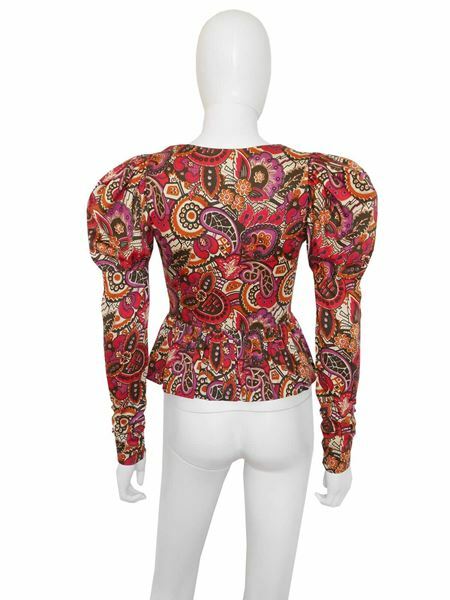 This rare Alexander McQueen suit from S/S 2002, the "Dance of the Twisted Bull" collection, comprises a corseted jacket and an asymmetrical ruffled skirt. 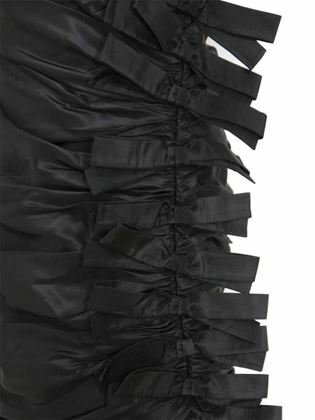 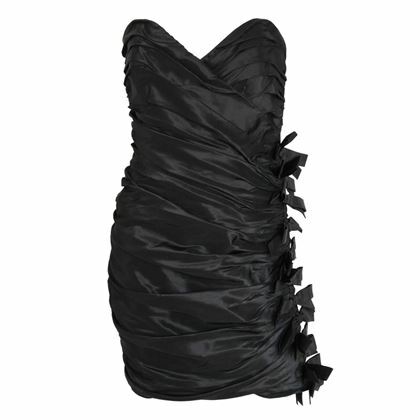 An amazing Angelo Tarlazzi cocktail dress made from beautifully draped black silk taffeta, with a row of bows on one side. 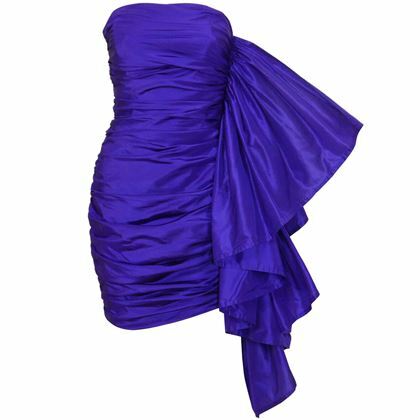 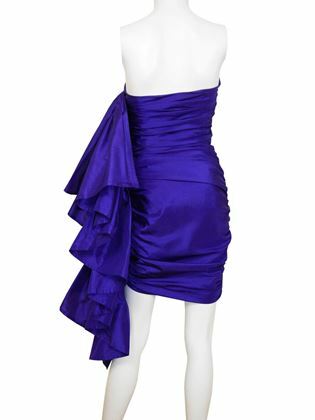 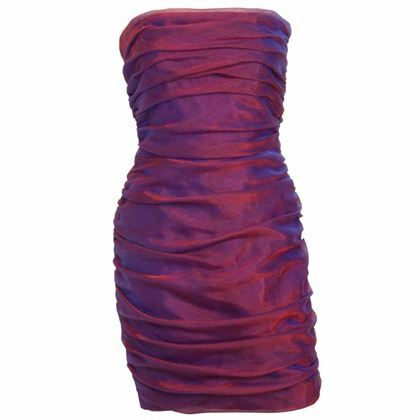 A spectacular asymmetrical Angelo Tarlazzi cocktail dress from the 1980s, made of a purple silk taffeta. 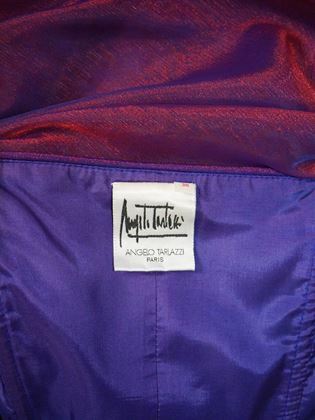 A spectacular Angelo Tarlazzi cocktail dress from the 1980s, made of an iridescent organza fabric. 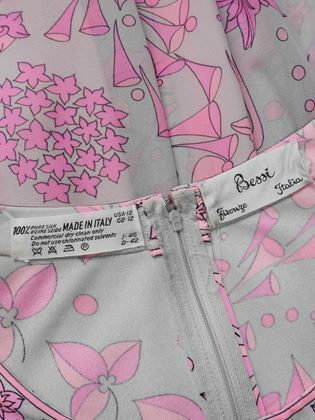 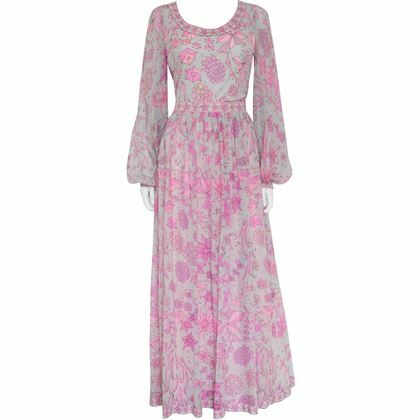 A dreamy Averardo Bessi grey and pink silk evening gown from the 1970s. 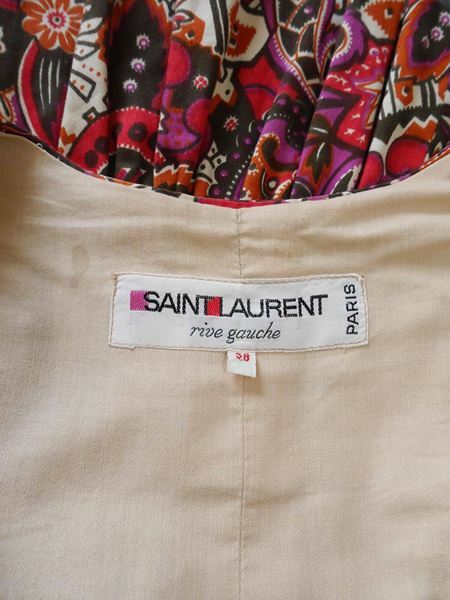 These rare Chanel logo sunglasses from S/S 1993, originally modeled by Kristen McMenamy, feature a white plastic frame with round tinted lenses and "Chanel Paris" and interlocking "CC" detailing.